Use sign frame vertically or horizontally, making it 7" x 5-1/2" or 5-1/2" x 7"
This plastic frame can be mounted directly (without a stem or stem mount) to this flat shovel base, SHB-005. 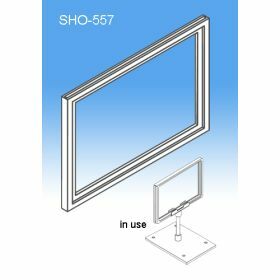 This plastic frame can be mounted to the magnetic base, SHB-011 with the use of our stem mount as well. Our 7" x 5-1/2" styrene sign frame is well suited for retail environments. 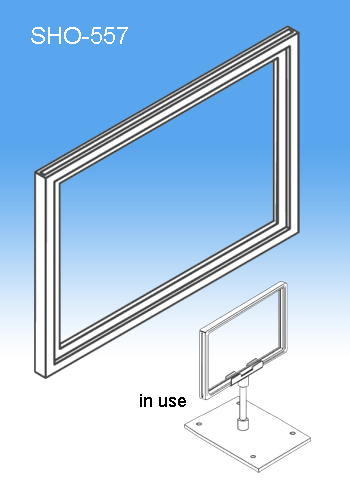 It is part of a modular system that includes different size stems and different types of bases, including a magnetic version. Used in-store at a multitude of retailers, from mass market to specialty stores due to it's versatility, affordability and professsional look, and is easy to switch out printed messages. 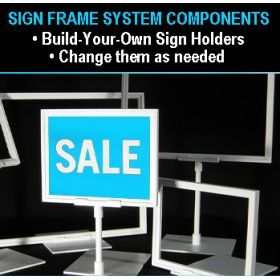 Sign Holders are an important and large part of our retail merchandising and sign comunications components product line. Browse through and make sure you are choosing exactly what you need; we have plenty of options for off walls, on counters, from ceilings, on displays and the shelf edge.